Advanced oxidation processes (AOPs) can effectively degrade several toxic pollutants, as well as inactivate pathogens in different environmental matrices (water, wastewater, soil, air). 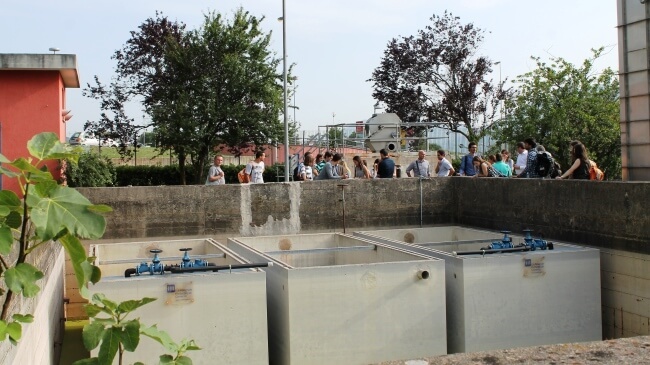 Due to their potential as successful solution for environmental pollution problems, AOPs have been attracting the interest of researchers, practitioners and enterprises operating in the field of environmental remediation technologies. In order to promote the higher education of young researchers in the environmental applications of AOPs, as well as to overcome national boundaries and bureaucracy barriers, a group of European scientists (Management Committee (MC)) from different Universities and Research Institutes, with a strong and internationally recognized expertise in this field, founded (in June 2014) the “European PhD School on Advanced Oxidation Processes”. Presently, the School includes 40 Scientific Committee members from 12 different European Countries. One of the Objectives of the School is to award with the label “European PhD on Advanced Oxidation Processes” candidates already awarded at their own University, who successfully finalized a high quality scientific research program on the environmental applications of AOPs. Accordingly, PhD holders already awarded at their own University with a thesis on the environmental applications of AOPs, are potentially eligible to get the label of “European PhD on Advanced Oxidation Processes” and they are invited to check the requirements set by MC and eventually to apply for (please see “School Candidates” page for details). Moreover, PhD students meeting the requirements 1 and 2 set by the MC (please see “School Candidates” page for details) are invited to apply as School candidate for “European PhD on Advanced Oxidation Processes” label, thus taking advantage of the initiatives specifically addressed to them. Requirements, application form, list of Label candidates and opportunities. Promoting the high specialization of young researchers in AOPs processes and their environmental applications. Who may have an interest in collaboration with the School? Sounds interesting ? View the requirements and fill in the application form!